The E60MA holds a special place in my heart. 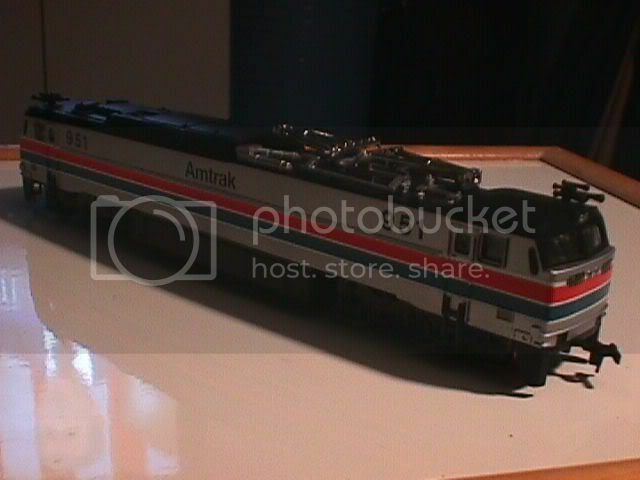 It was the locomotive that pulled the very first Amtrak train that I have ever been on, the Broadway Limited (February 1994). 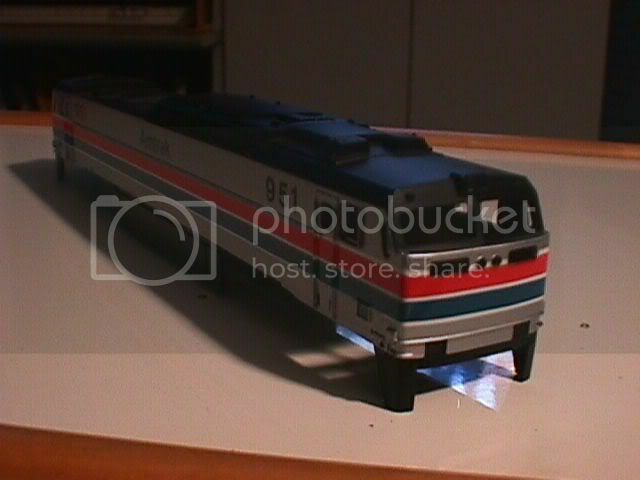 This was also the first HO Amtrak locomotive model that I have ever gotten. 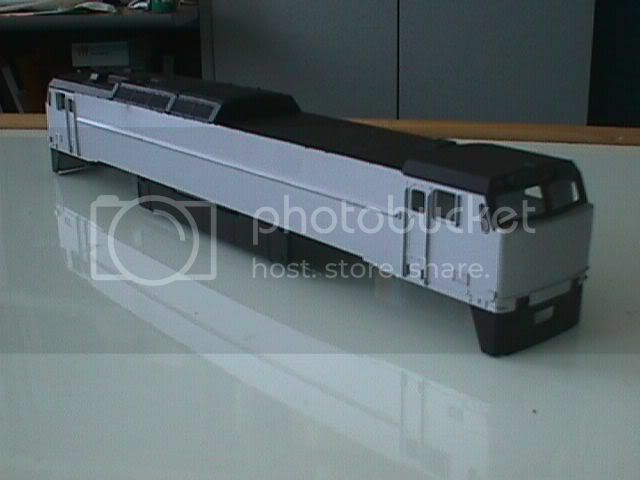 By the year 2000 I attempted to repaint my Bachmann E60CP to resemble an E60MA however it looked fairly mediocre. I made a similar attempt in 2001 when I lucked out and found another model with the same results. Just when it seemed like it was over, I lucked out and found another E60CP on eBay. I also had a great deal of help and advice from Michael Kreiser who has already started a similar project. In fact his project inspired my attempt at the E60 rebuild. In addition to the modification of the shell I am also attempting to re-power the locomotive with an Athearn U33C chassis with the appropriate modifications. 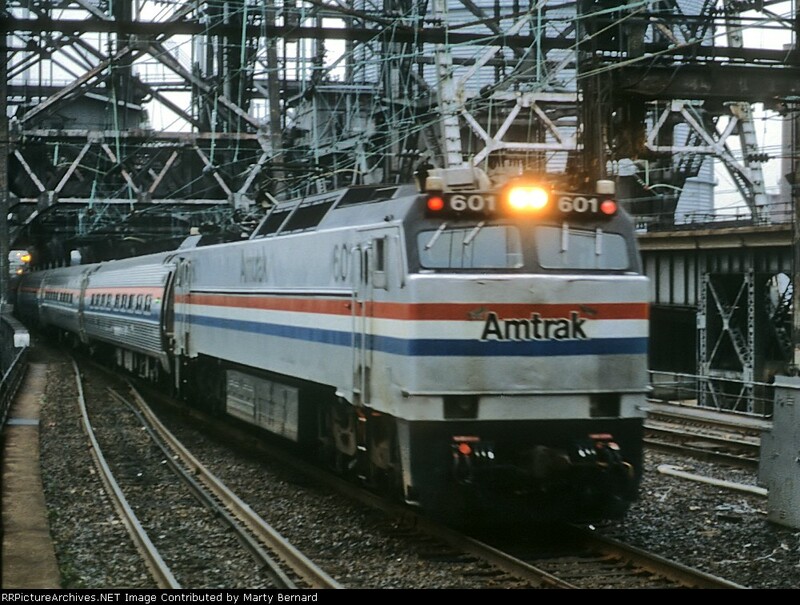 The E60CP entered service in the mid 1970s when Amtrak was looking to supplement/replace the fleet of GG1s that were formerly owned by the Pennsylvania Railroad. Their entry into service was heavily anticipated yet their performance was not what people expected. They were geared to run at speeds of about 125 mph but were regulated to about 90 mph because they had a tendency to derail. A number of E60s were sold off to New Jersey Transit. 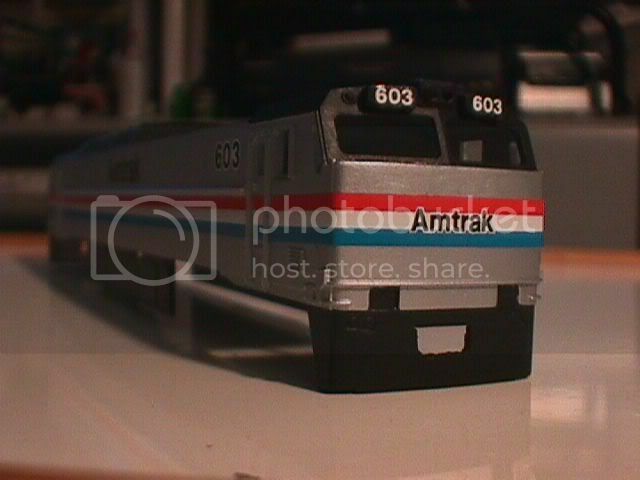 13 remained in Amtrak's roster and were re-built into an E60MA. Visible changes were the elimination of the number boards and headlight on the nose of the locomotive, the phase III paint job, and the 600 series designation. The E60s were originally numbered in the 900 series. I can't stress enough, my appreciation for Michael Kreiser's help and encouragement. I also have to thank a new friend of mine, Mike Thomas (a fellow Amtrak modeler, Northeast Corridor to be exact) for inspiring me as well as giving me direction as I attempt to re-power the locomotive. He has given me technical advice as to what to do and how to do it. This is the E60CP from Bachmann as it comes, originally and this is the last time that this locomotive shell will appear like this again. 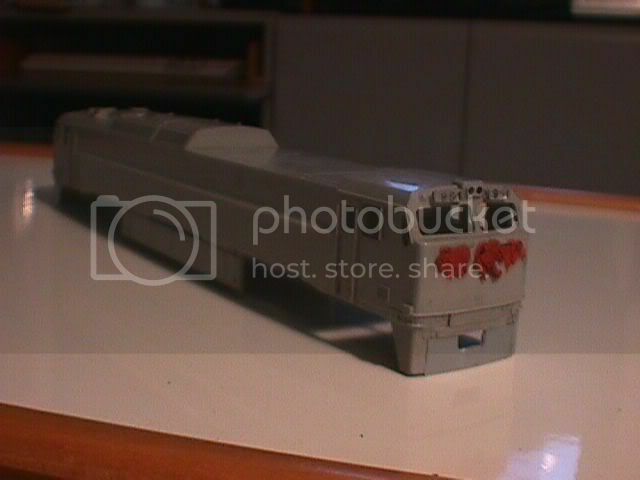 Using 91% Isopropyl Alcohol, I stripped the factory paint off of the locomotive. I soaked the shell in alcohol for about 10 to 15 minutes and then placed it under cold running water while gently scrubbing off the paint. I had to repeat this procedure a number of times until all of the paint was removed. You will also note that the old number boards that initially mounted on the nose of the locomotive were altered and re-located above the windshield. Details west parts can also be used however this was more of an economical measure I have taken. In this picture you can see that I have already begun to apply the modeling putty to the locomotive shell. Wednesday 1/28/04 When talking with Michael Kreiser, he recommended "Revell's" modeling putty, but I was unable to find any here at home. Instead, I ran into modeling putty that is produced by "Testors". I initially wanted gray modeling putty but after covering the entire shell with gray primer, it shouldn't make a difference. The benefit is that interested modelers interested in duplicating the project can see exactly where the putty is applied. I used very fine sand paper to smooth off the sides. Many different coats of putty may need to be used to fill in "gaps" left behind by the previous coat of putty. Gradually, less and less putty should be used for each coat. To close up the hole in front of the trucks, I cut pieces of plastic from scrapped models and cut a hole for a #5 Kadee coupler box. I also used similar materials to cover the holes that once held the number boards. This is needed when using the putty to plug up those holes. Note: Putty was applied between the locomotive shell and the number boards which were angled so that they would be 90 degrees with the horizontal. Saturday 1/31/04 The two ends were sprayed with dark aircraft gray primer. At first I was advised to go with acrylic however, I suspected that the acrylic paint may allow for the small imperfections to show through easier than the enamel that I used. After the primer was applied on the front ends, the entire shell was painted with Metallic Silver. Sunday 2/1/04 The black rooftop and battery box as well as all other black areas were painted using Testors flat black acrylic paint. It was brushed on rather than airbrushed because I have pretty much lost patience with the airbrush. All that is left to do now is to decal it and seal the decals with clear "dull coat". Sunday 2/1/04 The locomotive shell has been decaled with number 603. If I wanted to be more prototypical, I would have numbered it 609 as this model's original number was 951. The prototype locomotive numbered 951 was renumbered 609. All that is left now is clear coating the locomotive. I'm not sure if I want to go with dull or gloss coat. If anyone has any suggestions, don't hesitate to email me. Once the clear coat is applied, I will then begin re-installing the pantographs and windows. I will be using the AC boxes from Atlas' AEM7s as suggested by my friend Mike Thomas. This is the case with the prototype. Both the AEM7 and E60 use the same AC box. MU cables and other details will be applied later on. The Mary Lindsay Railroad is in no way affiliated with or sponsored by any transportation agency or provider. All trademarks and service marks are property of their respective owners.